Asia, - 2 people like this. Two hundred years ago, Europeans started referring to the region between India and China as Indochina. Already, it was recognized as one of the most beautiful, exotic, culturally unique destinations on the planet. With its very strategic position, Indochina was also center-stage in some of the defining conflicts of the 20th century including the Pacific theater of WW2 and the Vietnam War. Fast-forward to today, and the legendary countries of South-East Asia - SEA for short - are magnets for travelers by land and sea. Dense tropical jungles and one-of-a-kind plants and wildlife, fabled rivers and waterways, beloved cuisine, some of the world's most beautiful beaches, mountains tiered with rice terraces, gilded temples and Buddhist monks, dizzying markets and spectacular sunsets are hallmarks of these nations. The term Indochina, or the French Indochine, is still used particularly to refer to traditional or colonial culture in the region, which you'll still find preserved in these rapidly-growing economies and modernizing nations. This nation tops nearly everyone's SEA travel bucket list, from backpackers to those in search of 6-star luxury exotic escapes. The Land of Smiles is a smorgasbord of South-East-Asian culture. You won't want to miss Thai cuisine at the source in fabulous restaurants or from street vendors or markets. 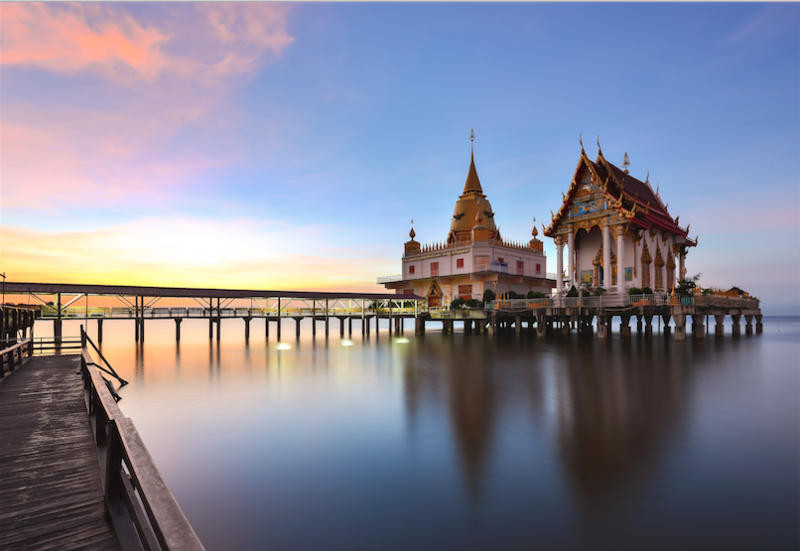 There are 40,000 temples in this kingdom, including one containing the world's largest solid gold Buddha in Bangkok. The capital is firmly in the world's top-three global travel destinations every year, and also home to floating markets, tuk tuk taxis, royal palaces and massive shopping malls. 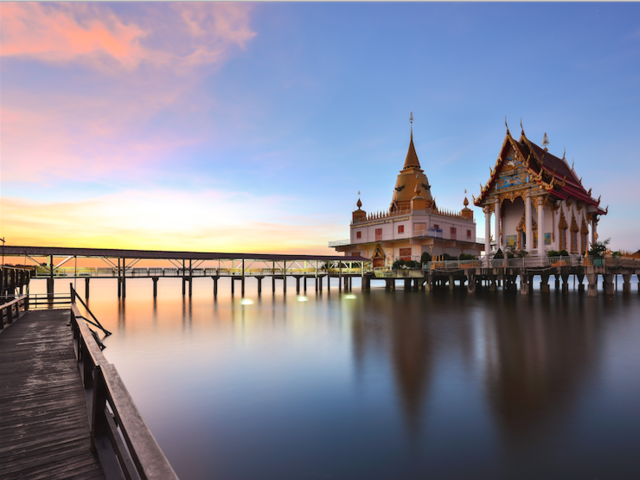 Thailand's rural attractions include jungles and elephant sanctuaries, legendary beaches and island destinations like Phuket, Koh Samui, the famous Sunset Beach on Koh Kradan and the Golden Swan Temple (pictured top). The tragedy of the Vietnam War is in the past for modern Vietnamese who are among the warmest people in Asia, if not the world. The still-communist country welcomes growing numbers of American and Western visitors. Many travelers – especially Americans - find it hard to believe the country permits and even promotes interest in Vietnam War-era sites like tours to the Viet Cong's legendary Cu Chi tunnels near Ho Chi Minh City and the famous American R&R China Beach near Danang. Everyone visits Ho Chi Minh (HCM) City and its ornate, French colonial public buildings, famous historic hotels and the top-ranked Saigon market. But don't miss other cities in Vietnam like historic imperial Hue and the ancient canal town of Hoi An – stay in town long enough to have some custom-tailored clothing made! An day trip or even a journey on the mighty Mekong river, with its floating markets, and entire communities is unforgettable. 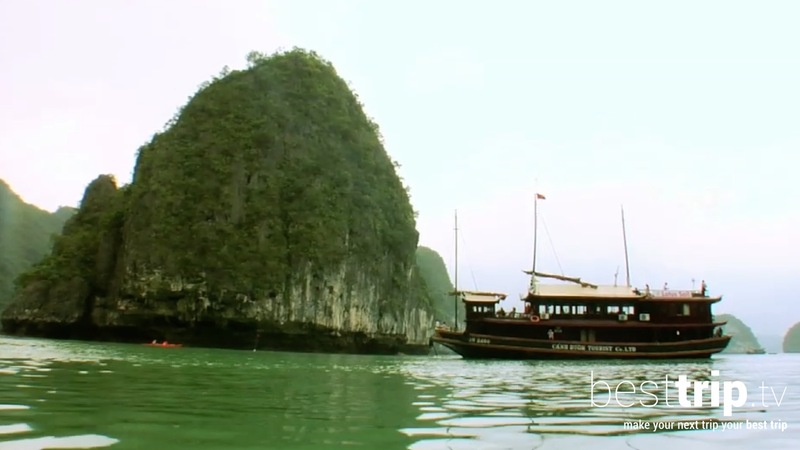 And UNESCO World Heritage site Halong Bay's emerald waters and mystical islands are a traveler's dream. This is the only land-locked nation in Indochina, and perhaps that's why it's later to the tourism party than other SEA countries. For many travelers, the path least traveled is exactly where you'll want to go next. The highlight of any trip to Laos is Luang Prabang. This UNESCO World Heritage Site has been inhabited for thousands of years, nestled in a valley where the mythical Mekong and Nam Khan rivers meet. Luang Prabang is a cultural and religious center with historic temples, serene Mekong river scenery, the magical Kuang Si waterfalls with its series of swimming holes, falls and ideal picnic sites, and even an Asian black bear rescue center. For travelers, Cambodia's has two claims to fame: one joyful, the other very dark. Travelers to neighboring SEA countries take trips into Cambodia solely to visit iconic UNESCO World Heritage Site Angkor Wat. This 12th century temple is part of the largest religious monument in the world – a 400-acre complex isolated by a dramatic moat that is a top global bucket list destination. Equally compelling but difficult to experience are the museum and sites associated with the Khmer Rouge genocide known as The Killing Fields. But there's more to experience in the capital Phnom Penh: Cambodia's position where Mekong and Tonle Sap rivers meet made it the natural center for both Khmer and French colonial regimes. Today, its busy riverfront, art deco market, Royal Palace and Silver Pagoda make it worth an extended stay to explore. The country formerly known as Burma is fast becoming a country that adventurous travelers want to see before the tourist scene gets very busy. The capital city Yangon is home to ancient Buddhist sites, including the oldest pagoda in the world. The Shwedagon pagoda dates back 2500 years, and is the national symbol and holy site of the nation. Outside the capital you'll find one of the world's greatest archaeological wonders: the 2300 pagodas and temples on the plains of Bagan. You can even get an overview of the entire complex on a hot air balloon ride. Inle Lake, surrounded by misty mountains, is a time capsule of local people who still live with the land in stilt houses, with floating gardens and a famous fishing technique. Rudyard Kipling coined the phrase 'Road to Mandalay' to refer to the majestic Irawaddy River. Some major cruise companies offer river cruise tours on this exotic waterway. Mainland Malaysia occupies the southern end of the SEA peninsula, as well as parts of the nearby island of Borneo. The wilderness is famous for wildlife reserves protecting endangered orangutans, tigers, rhinos and elephants, the beaches of Langkawi, and storied tribes of head-hunters whose villages on stilts over rivers in Borneo you can still visit. Cooler Cameron Highlands are home to tea plantations where you can do a tasting tour. Colonial European heritage landmarks include the sites in colorful Malacca, and Penang's landmark Eastern & Oriental hotel – a sea front sister hotel that pre-dated the famous Raffles in Singapore. Don't skip Malaysia's ultra-modern capital Kuala Lumpur. KL is a fascinating vision of the future of SEA, not to mention the record-breaking Petronas Twin Towers connected by a sky-high bridge that's featured in action films and many an Instagram post. This city-state and global financial center at the end of the Malaysian mainland is the only island nation of SEA. Singapore has preserved a core of its colonial past, with high rises surrounding the historic cricket field and colonial buildings, including nearby, one of the world's most famous historic hotels. 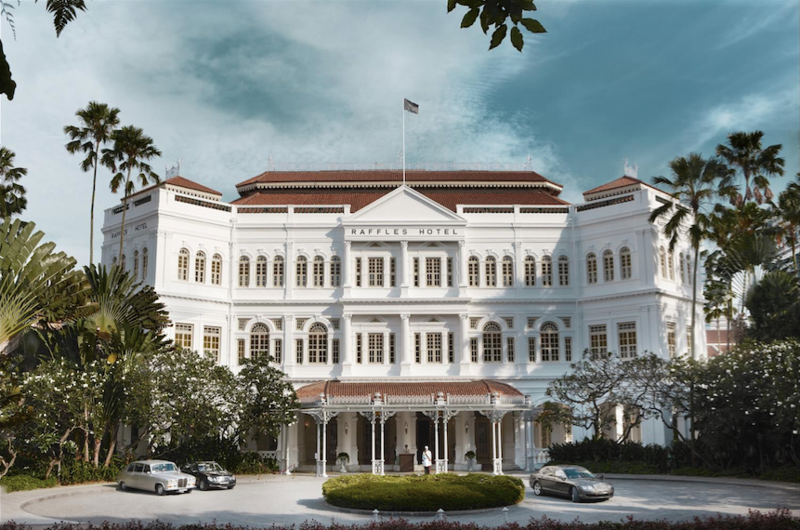 Legends are still told of the early days of the Raffles Hotel and the Long Bar, where the Singapore Sling was invented. Take time to wet your lips with one of the world's most famous cocktails and soak up the bygone atmosphere. But Singapore is more famous now for its almost surreal ultramodern vision and skyline. The symbol of modern Singapore is the already-iconic Marina Bay Sands Hotel and Casino's three-pillar towers topped by a surfboard-like top floor with the world's largest infinity pool overlooking the city. The 250-acre Gardens by the Bay, with the grove of futuristic super trees takes Singapore's love of green space to a space-age level. Singapore is a popular SEA cruise port of embarkation/ debarkation, and well worth extending your trip pre- or post- cruise to explore. Indochina is no longer a place on a map – but it's still one of the world's top travel destinations. Here's 1 comment for "7 Places Not to Miss in Indochina"
Great post. I would include that 'Extraordinary synthesis is a pleasure to the eye' as well; that is the reason we have each one of the styles and outline slants to make it is a pleasant undertaking for readers. The custom papers are not exchanged as pre written custom essay writing service ( [link removed] ) administration organizations they furnish their clients with just quality papers. 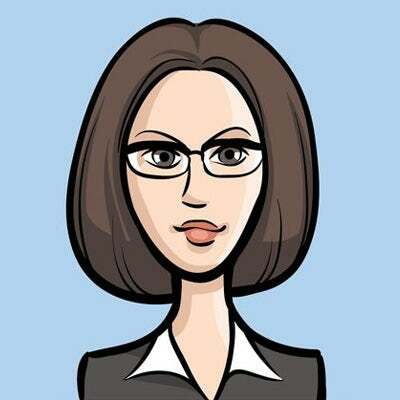 You may really deliver up a play for him or her, or in the event that you may most likely buy an at this point written and distributed have around with that isn't exceptionally required for reading.